262 Sunday March 10th 1889 It was rather a pleasant day. I was busy most of the forenoon getting dinner. We had turkey. Mother, Ott & Forney were over. I visited with them all afternoon and wrote a letter to Mary Wolf in the evening Monday March 11th 1889 It was a nice day. Adda did the washing. I was busy most of the forenoon getting the dinner. I cut out three shirts for Will in the afternoon and worked on them a little in the evening. I got some little time to practice. Tuesday March 12th 1889 It was a splendid day I was out among the chickens awhile in the morning and got the dinner while Adda ironed. I did the mending in the afternoon and sewed on shirts I practiced a little in the evening and wrote to Lizzie Duncan Wednesday March 13th 1889 I intended to go to the valley but it looked too much like rain. Will went down to a sale. I practiced some in the morning and worked on Wills shirts all afternoon. Mother was over to get her dress to wear to the funeral of Al Moon and Mrs Anson Hart tomorrow. Poor Al came from the south on Monday morning and died in the night. I set the first hens today. 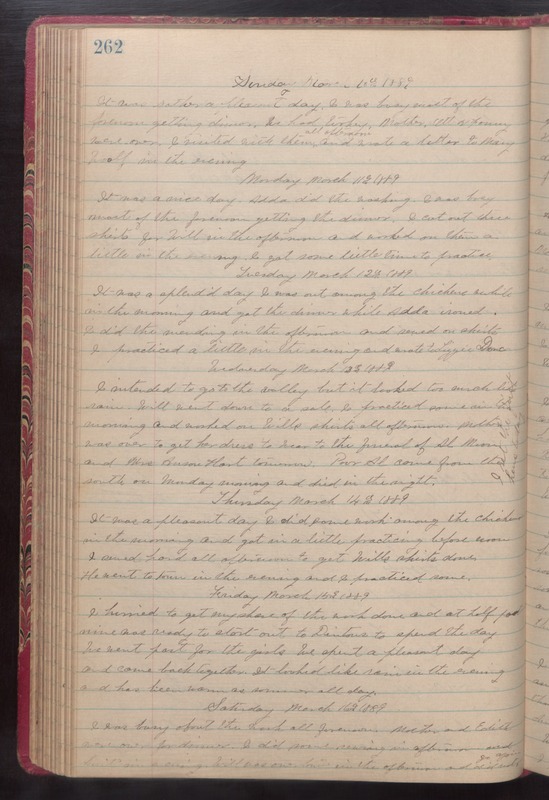 Thursday March 14th 1889 It was a pleasant day I did some work among the chickens in the morning and got in a little practicing before noon I sewed hard all afternoon to get Wills shirts done. He went to town in the evening and I practiced some. Friday March 15th 1889 I hurried to get my share of the work done and at half past nine was ready to start out to Dentons to spend the day We went part for the girls We spent a pleasant day and came back together. It looked like rain in the evening and has been warm as summer all day. Saturday March 16th 1889 I was busy about the work all forenoon. Mother and Edith were over for dinner. I did some sewing in afternoon and knit in the evening. Will was over town in the afternoon and did not go again.